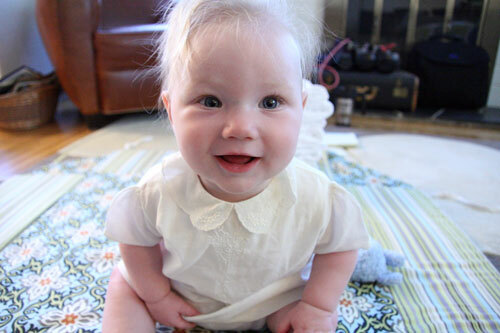 One of our readers, papa to little Olive, reached out to us asking for some of our favorite places to find inexpensive (under $25) but cool clothes for babies. We’ve found surprisingly cute stuff at mainstream stores. Target is a favorite. 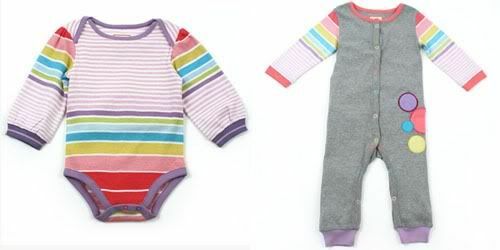 Their Dwell Studio for Target has really great onesies and outfits that are super cheap—like two pieces for under $15! I gotta say, I’m particularly in love with the bus t-shirts. 2. Little Miss Matched outlet! The Little Miss Matched outlet is full of goodies that are worth snatching up when you can. They often go as low as 80% off. I so love the terrific splashes of color—most of these pieces are under $5! And these great butterfly ones from Eggo in the Oven. 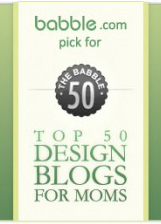 or these green cuties from BabyFrills. I think I spent $2.00 on it. Now we’re talkin’! There always seem to be a lot of girls dresses for small babies that would be terrific particularly for the summer. Of course little knitted vintage sweaters are usually so soft and often made of easy wash nylon fabric from the seventies. 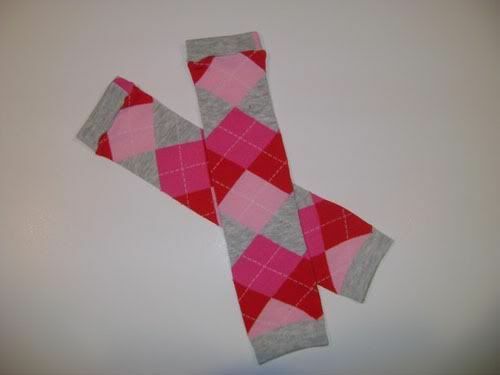 And have you seen this gorgeous lot of knitted items from Ebay seller, 9000pam with a starting bid of $4.00? The yarn alone would have cost around $50 let along the hand knit cuteness of it all. Those are my tips. What are your suggestions for Olive’s Dad? I was thinking about Thredup.com, but have you tried it? And of course Gilt is a great place to scoop up spendier brands at lower prices. They have some really cute stuff. Because this little girlie deserves a wardrobe as cute as she is! Hi guys! 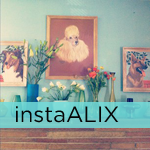 Alix here chiming in too. We’ve got some amazing tips flying in. One of my faves comes from Amber, which is something I firmly believe in too. Don’t be afraid to splurge here and there but don’t be afraid to try seemingly conventional shops for cheap basics. 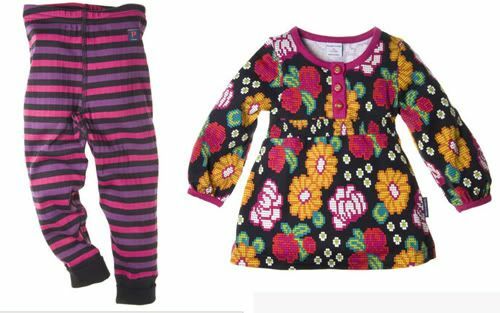 Get leggings and onsies in bold bright colors from mainstread retailers like Old Navy, Target, American Apparel, Children’s Place etc Then splurge on really cute shoes or dressies for little girls and fun tops or even wee cardigans for boys. Also, many mainstream brands will often have sneakily cute designs. My friend Jenny/frecklewonder posted a photo of her girl Dotty in thee cutest little jammies with amazing woodland creatures that looked like they were plucked out of a vintage storybook. “WHERE did you get those?? ?” I was expecting her to name some trendy brand but her response? “The Kohls baby shop!!! Can you believe it?” So always keep your eyes peeled, friends. Treasures lie everywhere if you are crafty! Ok, so here are 5-10 on our Top 10 Tips! 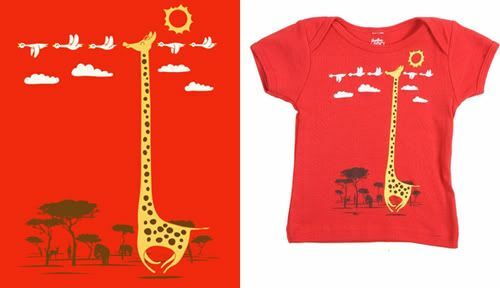 I think these sweet animal silkscreens from Colette Kids are really fun and bold. They have a great sale section. These Scandanavian prints are all the rage lately, and I’m still not tired of them. 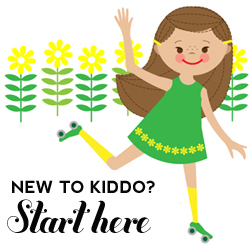 Check out the sale section at the fabulous Ittikid’s online shop. 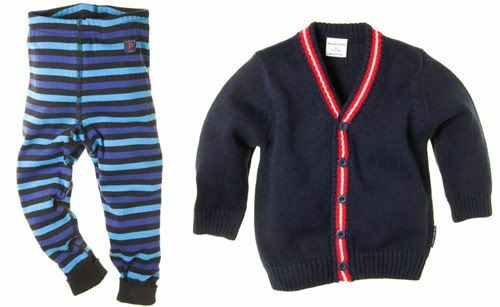 We are also big fans of Polarn O. Pyret—more for their fantastic toddler and big kid clothes, but they also have reeeally cute baby basics. 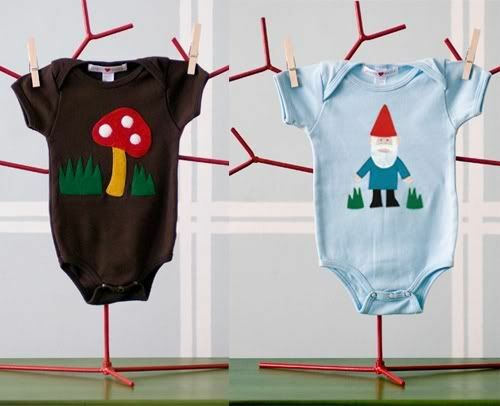 Check out these cuties (currently all on sale for $20 or less) available in sizes 4-6 months and up! I looove their shirts and onesies. They are playful and whimsical. 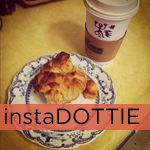 Sometimes a little more on the hipstery side but always quirky and fun. 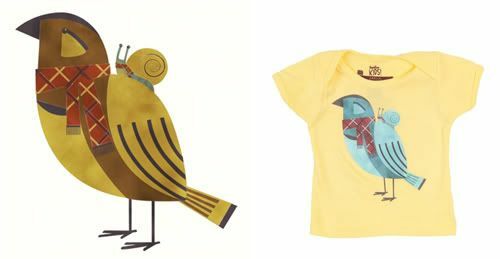 If you are lucky enough to live in Wicker Park, Chicago you can hit their actual store front, but for the rest of us we’ll have to shop online at Threadless Kids. Best of all they have fantastic sales and all onesies, tees and hoodsies (a onesie with a hood, doncha know!) are only $9 clams. 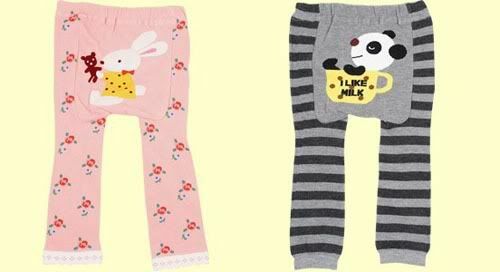 Ebay seller BabyGearStation carries these super adorable Japanese baby leggings with sassy bums. They’re only $3.99 a pop! 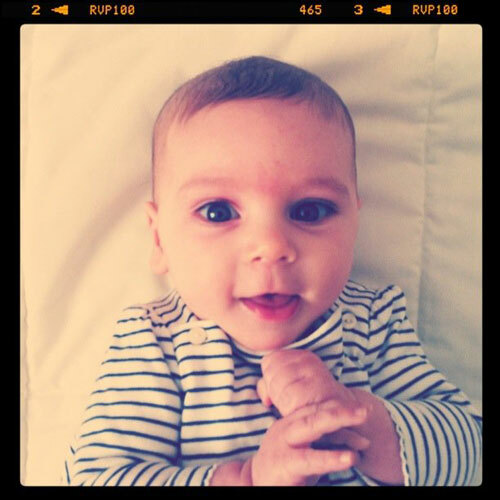 Crazy cute…. I’m sure there are many many more places to get cheap goodies….we’ll keep doing these posts as tips roll in! Oh and one last thing…when you feel like a splurge. 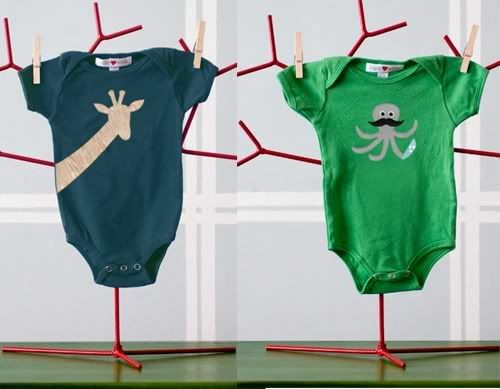 How cute are these adorable onesies from Jasper Wren? I love the fairytale kinder vibe of these Black Forest cuties, but the octopus with the ‘stash is my favorite! 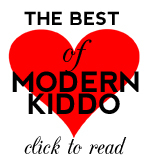 Posted in Baby Kiddo, Best of Dottie, Kiddo Style: Modern. 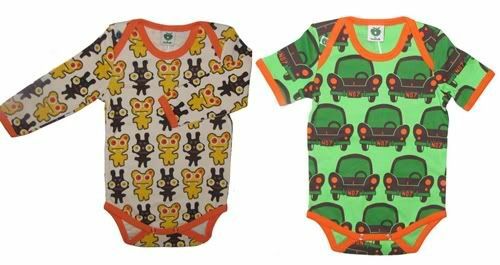 Tagged with Best affordable baby clothes, Inexpensive Baby Clothes, Stylish and cheap baby clothes, Tips for Affordable Cute. I was going to try thredup but it seems a bit scary. You don’t know what will be in the box and most of what I saw was brands like Circo and Old Navy, which are cheap to begin with. I’d rather just buy what I know I like from there anyway, you know? I totally agree, Amber! Thrift stores and used clothing stories are the bomb! I just picked up some great items for Georgia there too! 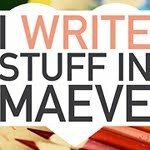 VERY interesting feedback on ThredUp! i just need to chime and i say that i met amber through swapmamas! we actually swapped kids clothes! i no longer trade through swapmamas i just trade clothes locally with my friends! that is why most of pip’s closet is hand me downs! my go-to source is definitely thrift stores. it might take a while to find a really good one, but once you do, it’s like hitting the jackpot! mine is just a few minutes from my house and carries a lot of name brands. every holiday, there is a 50% off sale. so i can hit that up and walk away with a bag or 2 crammed full of almost new clothing for next to nothing. (latest score I’m most proud of – skinny jeans from Baby Gap from last season – $1.50!!) you have to be careful of course, and look everything over to make sure there are no stains, tears, etc. but the savings are definitely worth it. my other source is consignment sales. there are several Just Between Friends sales in my city and the one closest to me is ridiculously huge. everything for sale has been inspected before it can be placed on the racks, so it should all be in good shape. the only downside is that sellers come up with their own prices, so some items are really affordable, while others are way overpriced. good luck! and have fun dressing up that cutie! Thrift stores for sure! I don’t even have kids but I go through the racks and score amazing pieces – some vintage and some new, usually in perfect shape – to give to my friends and relatives with kids. There’s some good baby thrifting in Nashville maybe. 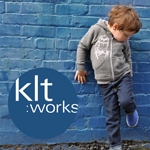 So true–I founds some awesome vintage toddler clothes from the Peach at the DI in SLC. And she loves those dresses! Their Facebook community is pretty active. If you post that you’re looking for a specific size and flavor, chances are a member will swoop in to build you a box. All of the boxes I have picked so far have been in great condition and fit with my style preferences (because I only pick boxes with pictures and full descriptions – no surprises!) However, I listed a few boxes of nearly-new separates (mostly Gymboree, not cheap) and never received a review or feedback from the boxes. Chaps my hide that I spent a lot of time documenting the contents and got no review for my effort. That brings me to the downsides. The site relies on honor systems, the “Golden Rule” and the honesty and integrity of its members. Frankly… you can’t control what other people do, or trust people as far as you can throw them sometimes, and there seem to be no consequences for members who are dishonest or just plain lousy community members. In general though, for $15.40 (a medium flat-rate USPS box + $5) it can either be a value for the brands you get or you could be overpaying. It’s worth it to sign up (for free) and cruise the brands regularly, you just have to be smart about it. Have fun shopping for your sweet Olive! 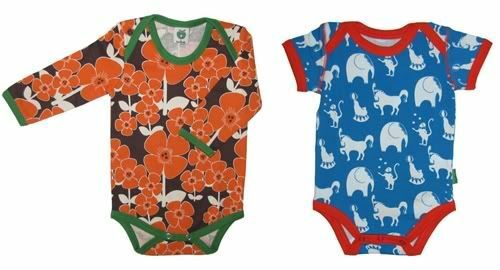 Prices for new preemie clothes are downright criminal, but when you’ve got a teensy one in the hospital it’s tough to get to a thrift store or troll ebay (and hope it arrives before she grows out of preemie and into newborn!). And everything is pink and blue, pink and blue. Snorey snore! …Which is why it’s so spectacular to have friends like Dottie to head to the thrift shop and find some fun preemie getups for you! I have to say, preemie wear is the toughest thing to find and crazy expensive. Excellent tips! I’m going to add a little update to this post in a bit with one of my fave tips—SALES!!!!! I had/have my fave sites that are very cute/stylie little duds but aren’t necessarily cheap (but great quality and designs). I make it a habit to check their sales and usually scoop up great buys for much less. Also, searching eBay for brand names is a great idea. Not to generalize, but the fancy moms who are buying fancy brands usually take great care of clothing and i have been able to score some really cool stuff that is ever so gently used! 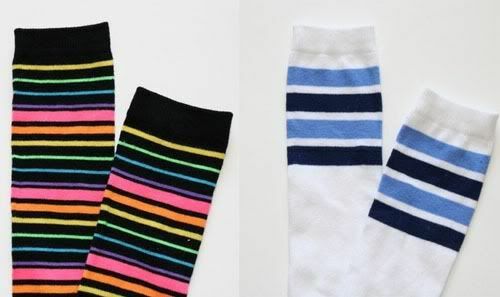 Ooh, I forgot to add that the clearance section of Happy Green Bee is amazing and cheap and I love their stripey stuff. Oh cool! I’ve never visited them before, i’ll have to check ’em out! Whoa! What a great find, Amber–thanks for sharing!!! I love thrift store finds. My sister volunteers at the local PTA Thrift Shop in La Habra, CA where clothing (all ages/sizes) is always $1 each and a lot of days clothing is 50% off the price – so it’s quite easy for me to spend only $20 there and leave with bags full of clothing. I’m also a recent fan of Crazy 8 (http://crazy8.com). They’ve got great sales going on right now. Those these purple striped leggings from Little Trendy Baby are super cute, but $35.00 international shipping for a $3.50 item (especially being so SMALL) is absolutely INSANE!!! WTF? That’s a really good way to lose sales and they should smarten up! Yeah that’s pretty steep!!! Living in the states, I don’t think Dottie or I noticed the international shipping rate. I just emailed her to see if it was an error! Yeah–that price does seem a little nutty! I’ll ping the lady for an update. Thx ladies! I hope she did make an error or else I wouldn’t call that affordable at all!!! HI Ms Farrah….you know, she never got back to me so I revised the list and pulled her from it! Thanks for bringing that to our attention. $35 is scandalous! Thanks for all the tips everyone! 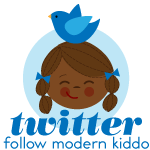 We picked up a couple of things from ittikid and we’ll be checking out the rest of the suggestions. If you live in Chicago the Threadless Kids shop on Division has an AWESOME bargain bin in the back of the store. I snatched up several newborn/3 months onesies for $5 each! Score! I wanted to follow up regarding our purchase from ittikid. We received our order, and realized one of the items needed to be exchanged. Their website states that you need to email or contact them within 3 days of receiving your items in order to return or exchange. I emailed them the very same day, and followed up that week with 2 voicemails. Today it has been exactly 1 month since I contacted them, and I have yet to hear back from anyone regarding our our exchange. I will certainly NEVER order from them again, and if I can ever get a return phone call, I’m going to just send the item back for a refund at this point. 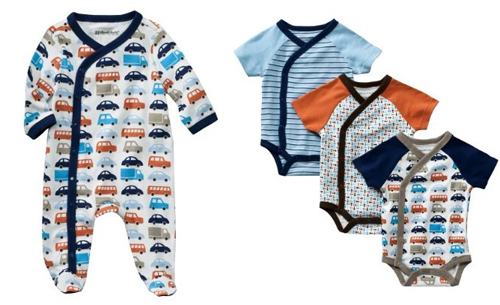 i’m on the constant search for baby boy clothing without cheesy sayings or sport themes. my favorites are h&m & old navy for the basics and zara.com the super cute stuff. h&m & old navy are always inexpensive and zara.com has great sales. i also love consignment sales & have gotten some of the most amazing deals.